1st Days Activities: The Amazing Elephant Experience. Elephant Hills Elephant Experience: Feeding, washing and interacting with Asia’s largest land animal. A really touching experience in an almost untouched environment. Canoe Safari down the Sok River. 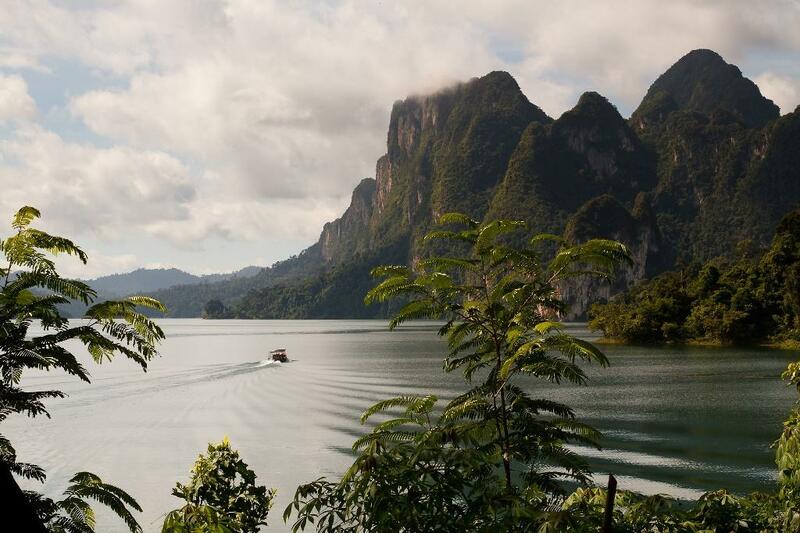 Sit back and enjoy the breathtaking beauty of Khao Sok. Evening Activities: movie presentation, dance performances and cooking demonstration. 2nd Day: Spectacular Cheow Larn Lake. Visit a local market in Takhun to experience Thailand’s rural lifestyle. Boat Trip. Sightseeing in a traditional longtail boat on Cheow Larn Lake. Lunch and free time at the Rainforest Camp. Self paddle canoes are available to explore the spectacular surrounding. Return to Elephant Hills in the late afternoon. 3rd Days Activities: Fabulous Rainforest. 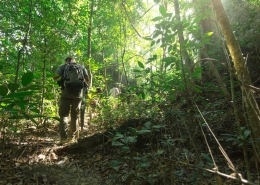 Jungle trekking by foot through Southern Thailand’s unique rainforest environment. Please kindly note that all mentioned activities depend on the weather and local conditions and may be subject to change! Pick-up from your hotel or the airport in Phuket, Khao Lak, Phang Nga, Krabi, Surat Thani or even from Koh Samui and transfer to Khao Sok. En-route, glimpses of tropical rural life here in southern Thailand can be caught. Upon arrival at Elephant Hills Camp, buffet lunch is served at 12:00pm, a variety of delicious Thai dishes cooked not too spicy awaits you. Get out of the canoe and head over to the elephant park. Here you can see, touch and learn about the life of Thai elephants and about the Elephant Hills elephant conservation project. 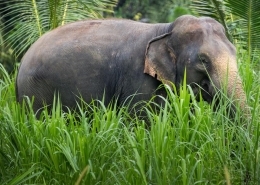 Your guide will also teach you about the mahout, the elephant caretaker. While participating in our amazing Elephant Experience you will get very close to and even get your hands on these magnificent animals, you will have the chance to interact with them and learn the secrets of their mahouts. You will prepare and feed them one of their daily meals, including their dietary supplements that help with their digestion and their overall well-being, then watch them bathe before you scrub and wash them clean. 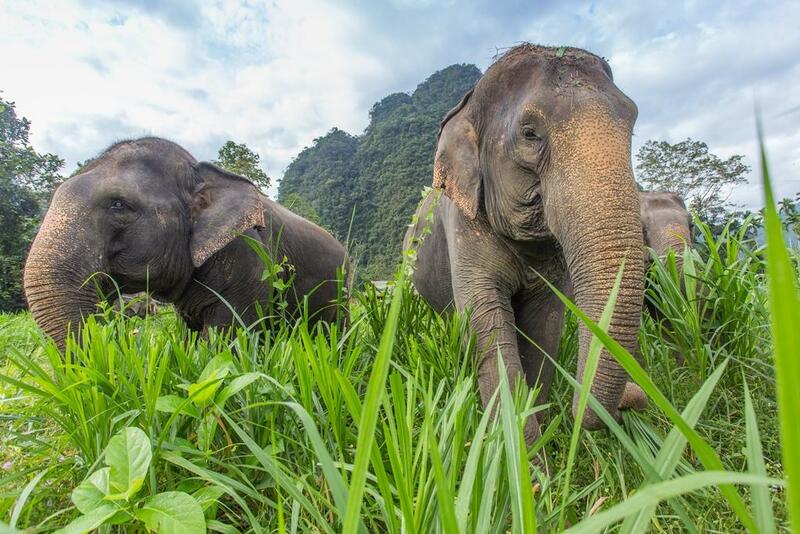 This is a once-in-a-lifetime opportunity to really experience the Asian Elephant, this part of the world’s largest land animal! 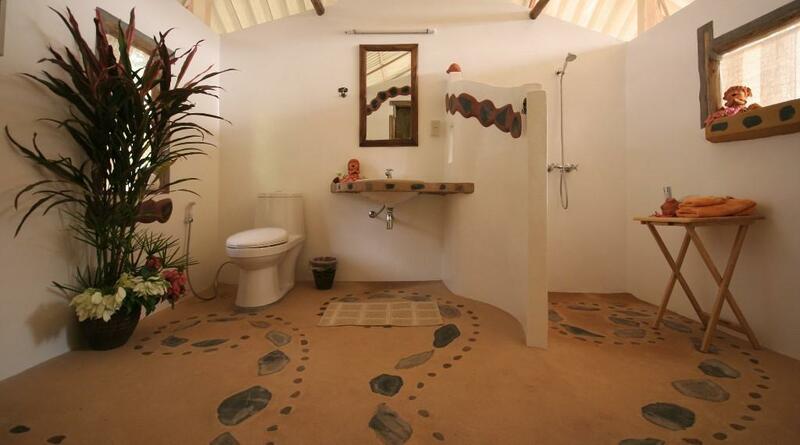 After all this activity close to nature it is time for a hot shower in the unique bathroom of your luxury safari tent. Relax and enjoy the panoramic views of the surrounding jungle-covered mountains – this is 100% real nature! A wide selection of cocktails, wines and spirits is available at the “Jungle explorer’s club bar”. Optional evening entertainment includes a movie presentation, a traditional Thai dance performance from local school children and a cooking demonstration, where you learn how to properly prepare Thai specialties. At 8:00pm it is time for dinner in this unique location beside the rainforest, the sounds and the atmosphere will make this a memorable meal. Spend the night in your luxury safari tent with a comfortable bed, reading lights, hot water and a western-style toilet. 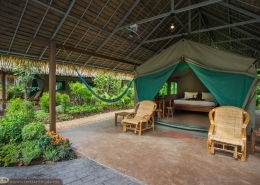 This is real luxury so close to the heart of the rainforest! Wake up to the sounds of nature and birds calling from the bushes next to the tent. By the time the sun comes up and the mist over the rainforest-covered mountains to the south of Elephant Hills clears, gibbons’ territorial morning calls echo down the valley. Tea and coffee making facilities are available in your tent for early risers; breakfast is at your leisure. 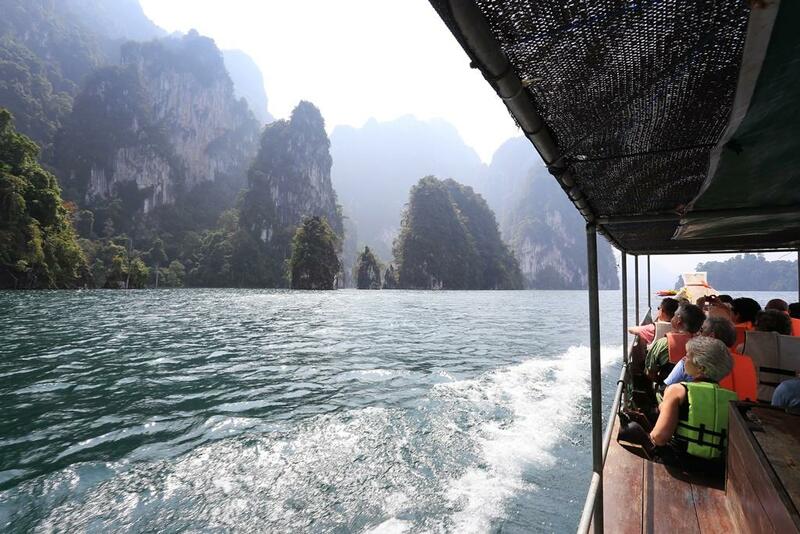 Today you will explore Cheow-Lan-Lake by local long-tail boat. 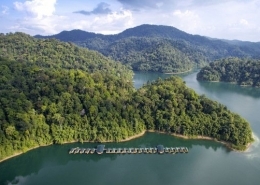 The man-made lake is surrounded by Limestone Mountains and cliffs covered in tropical rainforest that rise up from the shore of the lake and disappear somewhere in the far distance. The scenery has been compared to Guilin in China and Halong Bay in Vietnam. Few people know of the lake and even less have visited it. There are more than one hundred islands in the lake and it stretches over 60 km from North to South. In the 70’s the area was a hide-out for communists and students opposing the military dictatorship, which well preserved the area’s unique environment as it was spared from urbanization. You can enjoy the spectacular scenery from the boat and will have time to dip into the lake’s emerald water. Please bring your swimwear; towels are provided at the local raft house, where you will stop over for lunch and relaxation. 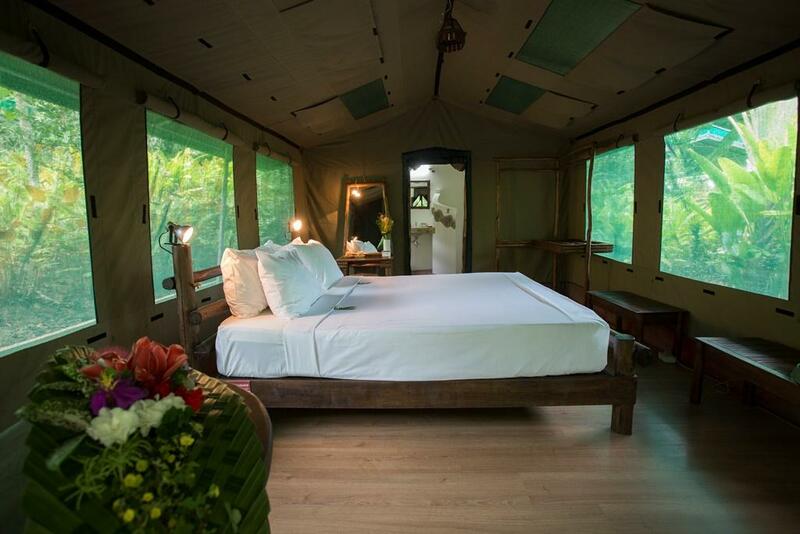 In the late afternoon return to Elephant Hills for dinner and overnight in your luxury tent. The jungle bar will be open for people wanting to exchange stories of their day’s experiences at the lake, and as extra entertainment you can witness a different movie, a different dance performance and a different cooking demonstration today – enough program to keep you busy until dinner, and enough action to ensure sweet dreams after you have been lulled to sleep by the background symphony of insects and frogs. Start the day with a wholesome breakfast before you will come face to face with the jungle by exploring it on foot. It is not an army survival exercise, there are no prizes for the fastest, snakes and spiders do not jump out at you – it is just an excellent opportunity to explore the ecology of one of the world’s oldest rainforests, to see a great variety of exotic plants, tropical hardwood trees with huge roots, orchids, palms, ferns, bamboos, mosses… the variety is huge. Birds such as the hornbill live high up above, gibbons can often be heard calling to their mates, a macaque or a leaf monkey may be swinging through the branches, beautiful butterflies buzz around – every day is different, but it is always truly wonderful to discover the great variety of life-forms that co-exists here together. Walk slowly. Look, learn and listen. 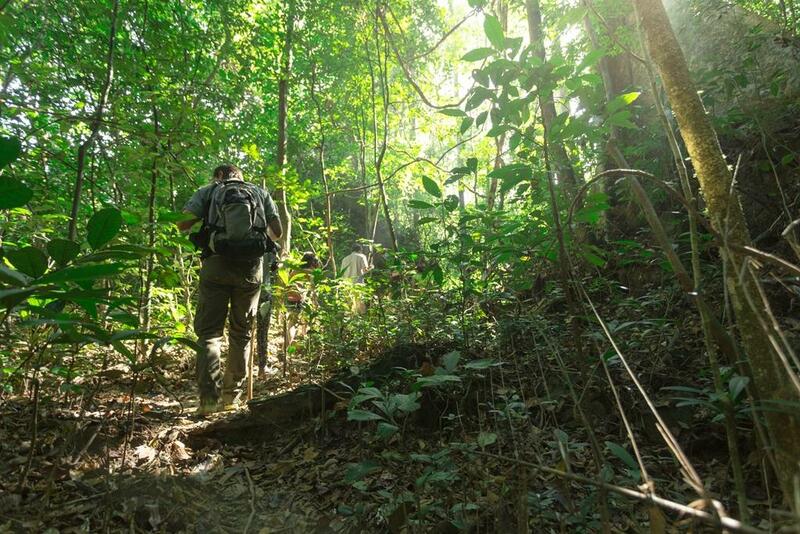 Then you too will start to discover some of the secrets of the rainforest. Weather-dependent lunch can be served in the rainforest, cooked in bamboo, an old tradition of jungle explorers from past centuries. Sadly around noon it is already time to return to Elephant Hills, and after a refreshing shower the onward transfer to your next hotel or the airport awaits you. All good things come to an end, they say, but luckily this unique experience will remain in your memory for the rest of your life! Please kindly note that all mentioned activities depend on local conditions and may be subject to change! Please tick this box if you would like to receive our Elephant Hills newsletter. You can opt out at any time. To support local school kids in Khao Sok, please take a look at our Children’s Project. From 13,210 THB per adult, all inclusive. From 19,500 THB per adult, all inclusive. From 24,535 THB per adult, all inclusive.